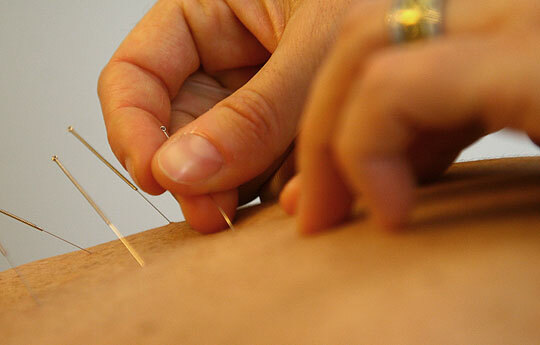 Study: Acupuncture Helps Ease Back Pain Acupuncture can help reduce lower back pain, according to a new study. But there's still an East-West divide over how it works. Some say it may be manipulating chi. Others say a more subtle neurobiological process is at work. At her Washington, D.C., office, acupuncturist Kate Yonkers consults with a patient who is having trouble with shoulder pain. In a recent study by the National Institutes of Health, acupuncture helped ease chronic lower back pain. If you've never had acupuncture, the vision of needles piercing your skin may sound more like a dreaded appointment with the phlebotomist to draw blood than a healing day at the spa. "I don't like getting blood tests or shots, those type of things," says Margaret Gillard, of Washington, D.C. So she recalls being anxious a little over a year ago when a friend referred her to an acupuncturist. But she also had an open mind. She was suffering from lower back pain, and traditional treatments — namely steady doses of Advil — were no longer working. After several acupuncture treatments at Kate Yonkers' acupuncture clinic, Gillard was hooked. "It's worked really well for my lower back pain," Gillard says. Acupuncture certainly isn't a cure-all. But there is gathering evidence to suggest that it can be beneficial. The latest study, sponsored by the National Institutes of Health, finds that a seven-week course of acupuncture helped many patients ease the pain of chronic lower back pain. The study is published in the Archives of Internal Medicine. The patients who volunteered for the study all ranked their chronic low back pain as at least a 3 on a scale of zero to 10. Researchers divided the patients into several groups. Some received the usual care for their back pain: medicine and checkups at their doctors. Other groups had the usual care — and also got acupuncture. "Most people got better," explains researcher Dan Cherkin, a senior investigator at Group Health Center for Health Studies in Seattle. "It's just that the people who got acupuncture were more likely to do better." About 40 percent of the usual care group saw improvements. About 60 percent of the acupuncture group improved. Findings like these have led to a growing acceptance of acupuncture as a treatment for pain. Last year, the American College of Physicians and the American Pain Society released a joint statement endorsing acupuncture as one nondrug option for clinicians to recommend when standard treatments for lower back pain don't work. Yonkers' clinic feels more like a spa than a sterile doctor's office. She plays Yo-Yo Ma, and the fragrance of lavender fills the waiting room. The walls are painted a subtle sage, and water trickles in a little tranquillity fountain. "It's very restful and calming," says Gillard. "I know it's just going to be time to relax and be by myself." When Gillard lay down on the treatment table, Yonkers explained that she was looking to insert needles in very specific points. "You put it in to a certain depth to get chi at the point," explains Yonkers. Chi, in the parlance of acupuncturists, means energy, or life energy. The intention is to get the energy flowing by stimulating the various points on the body. When the needle pierced her skin, Gillard felt a little pressure. "It wasn't uncomfortable at all," she explains. "And I can feel a warmth sort of radiating down my leg." It's not clear to researchers why some patients respond so well to acupuncture, and others don't experience a benefit. But according to the American College of Physicians' and American Pain Management's joint statement, patient expectations seem to influence the outcomes. Researchers are also unclear how the ancient practice actually stimulates a healing effect. An interesting twist to Cherkin's findings is that people who were given simulated acupuncture — the needles push on the skin, but don't penetrate — reported just as much benefit as those who had standard acupuncture. It's possible, says Cherkin, that stimulating these standardized points on the body, even without piercing the skin with needles, does cause a specific physiological process that reduces pain. But there's another possible explanation, too: Perhaps the whole ritual of performing an acupuncture treatment has a generalized effect. "The patient is feeling that they are getting a helpful treatment," explains Cherkin, "and as result the brain reacts in a way that leads to improvement." Whether it's the manipulation of chi — or another mechanism that explains the effect — it's the results that are of interest to Dr. Brent Bauer of the Mayo Clinic. "At the end of the day," says Bauer, "My greatest interest is, does it help my patients?"